When Jesus told the crowd who followed Him that He had come down “from heaven,” they murmured in curiosity. Today, He tells them something that caused quarreling to break out. What was it? As we noted last Sunday, Jesus engaged in a long discussion about “bread from heaven” with Jews who thought He might be the Messiah. They likely hoped that Jesus would do as Moses had done and cause bread to rain from above, proving Himself as such. Today, the conversation takes a dramatic turn as Jesus adds another piece of information about this bread: “The bread that I will give is My flesh for the life of the world.” What? Earlier, the Jews had “murmured” over Jesus’ surprising claim that He came down from heaven. Now, they were really stirred up in agitated arguing: “How can this man give us His flesh to eat?” Good question! Who of us, upon hearing this statement for the first time, would not be perplexed and put off by it? We must remember that these people were not the hard-nosed, hypocritical Pharisees who often objected to Jesus and His teaching. Rather, these were people with deep Messianic hopes. They had seen the multiplication of loaves, because they had been part of the large crowd who followed Him. They wanted to hear everything He had to say, but He was making this very hard for them. He kept saying difficult things. This becomes a pivot point in the discourse, as we will see more clearly in next week’s Gospel. Today we need to let it register with us how strongly Jesus made His statement about eating a meal that would include His flesh and blood in order to have eternal life. Lest there be any sliding toward an entirely metaphorical explanation of statements as bizarre as these, Jesus says emphatically that His flesh and blood are “true food.” Silent in all of this are His apostles, although we know they were there, taking it all in. Jesus often talked about things they couldn’t understand, but this time He pressed them to the limit. However, we can see that He clearly wanted to lodge in their imaginations the notion of a miraculous meal (just as was expected of the Messiah) consisting of His Body and Blood. When this sinks in for us, we can much better comprehend what happened at the Last Supper. This was what Jesus had been talking about! Surely it was difficult, even impossible, for the apostles to fully understand. Their reaction to Jesus giving them bread and wine as His Body and Blood is not recorded for us, suggesting there was no outburst of questioning or arguing. Were they putting all the pieces together? Did this action by Jesus at least start the answer to the question that began when the Jews first asked it earlier: “How can this man give us His flesh to eat?” He can do it by transforming elements of the Passover meal into something entirely new. He can give Himself in the food! Possible response: Lord Jesus, I never want to take for granted Your miraculous life-giving meal in the Eucharist. Thank You. We have in this reading a delightful poetic description of wisdom, a virtue earnestly sought by all who desire to live well. Every human being, regardless of his relationship with God, at some point wants to know how to live, how to make important decisions, how to advance through the vicissitudes of life to reach the end he desires. The proverb personifies wisdom as a woman offering the hospitality of a fine meal: “Let whoever is simple turn in here.” The food she “spread” on her table satisfies the hunger of “one who lacks understanding.” In a truly beautiful way, we see here how the Old Testament wisdom literature prepared God’s people for the joy of a meal that leads to true life: “Come, eat of my food, and drink of the wine I have mixed!” These words, of course, wonderfully describe our Eucharistic meal. Jesus, Who is Wisdom itself, offers us this very meal at every Mass. He invites us to “forsake foolishness that [we] may live; advance in the way of understanding.” How can we turn that down? Possible response: Lord Jesus, thank You that in the true food You offer us, I can find the wisdom I lack and strength to forsake my foolishness. St. Paul continues to give us valuable instruction about how people who have tasted the goodness of the Lord ought to live. His first exhortation is similar to what our first reading told us: “Watch carefully how you live, not as foolish persons but as wise.” He wants us to make the effort (and that’s exactly what it takes) to “understand what is the will of the Lord.” See how St. Paul contrasts drunkenness with being “filled with the Spirit.” The false and empty temporary merriment that comes from too much wine is contrasted to the true merriment that comes from walking in the Spirit. 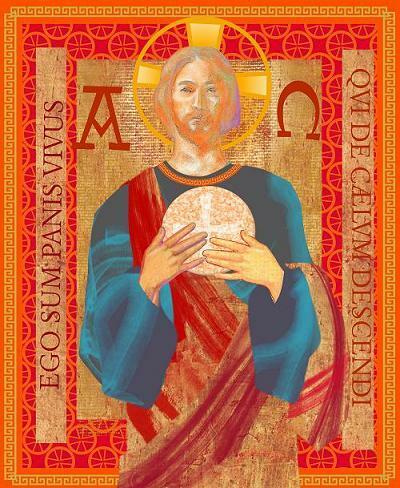 Much of what he describes is incorporated into the Mass—the emphasis on psalms, hymns, singing, and “giving thanks always and for everything in the name of our Lord Jesus Christ.” This is a phrase we hear regularly at the beginning of the Eucharistic prayer. It is in the Eucharist that we drink the wine that will make us truly happy.